Dear potential buyer. The following messages from customers who have shopped with us over the years are genuine. They were voluntarily sent to us and are not altered. 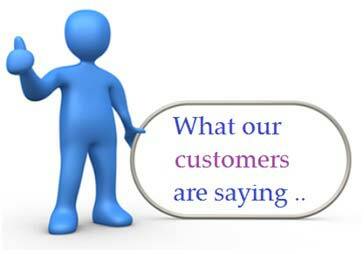 We wish to provide a true overview of people's opinions of our products. Seeking the perfect gift, I found a platinum-dipped Eternity Rose for my Mum’s Mother’s Day gift online. Upon purchasing and receiving it, I could not find the words to explain how beautiful the Eternity Rose is in real life. If I received this rose from a man, I would truly feel like a queen. When your package arrived on our doorstep, I played dumb so that my wife would open it. 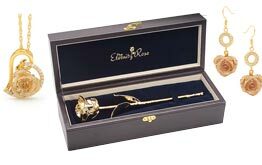 As she opened the package and saw the gold roses I purchased, she didn’t have any words to say. She was speechless. Personal reasons made this present very special to her. Thank you! Previous experiences with online shopping has left me with products that do not line up with what I have seen on the screen. These experiences made me doubt any online purchases; however, I am pleased to announce the Eternity Rose was a really pleasant surprise. It was an exact match. I ordered the luxurious platinum rose and received it within three business days in Scotland. It even came in a chic box! I bought this for my mum, and she was overwhelmed as she opened it. Her friends were jealous when she showed them and even asked how to get one for themselves. I will be purchasing more of these down the road. I received the rose I ordered a few days prior to actually giving it to my wife. When I finally decided to give it to her, the look on her face said more than I can write here with words. What I do want to share is how marvellous the quality of this product is; it is stunning! The amount of customer support I received was phenomenal. I have never experienced a business that provided the amount of assistance, even to help me pick out the rose. The last great thing I can say is that delivery was less than 48 hours and it came from halfway around the world! Thank you again. Thank you for such a great shopping experience. I cannot think of a single thing I am not happy with from the Eternity Rose. 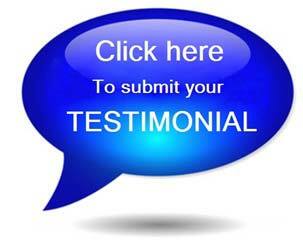 The products are high quality, customer service is exceptional, and delivery was prompt. 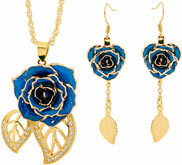 The Eternity Rose sets the standard in business ethic. I won’t hesitate to highly recommend this to friends and family. Last week, my wife opened her gift, a gold rose. She loved it, and it was perfect because it was our golden anniversary. I was searching for the perfect gift, and it came down to the last minute, but my package arrived just in time, as promised. I hope others discover your wonderful service, thank you. When I received the roses, I thought to myself, “They look even more impressive in person!” I purchased 6 roses for Christmas presents for my mum and five sisters. When they opened their gifts, it was the greatest feeling ever. I just had to share my awesome experience. A couple’s 25th anniversary is very special, so I wanted to find an equally special present for my wife. I purchased two silver roses, and she was so delighted she displayed them in the living room among her most favoured treasures from her grandmother. The order was delivered right on time. Eager to see a significant lady that I had been out of touch with for five years, I sought a perfect gift for when we reunited. Once I stumbled across the Eternity Rose, I knew this was it. I am impressed with the amazing service, especially after she quickly received the vase which I forgot in the original order. Since we couldn’t be together during this time, she has this rose to remember how special she is to me. I wanted to send over a quick thank you. I cannot wait to surprise my wife with this rose. I know she is going to love it. My fiancée broke the tradition of not talking on the day of the wedding once she received the red Eternity Rose I ordered for her. It was delivered to her in her hotel room while she was getting ready for our wedding. She told me over and over how much she adored me and how much she appreciates such an extravagant gift. It made her day special, as well as mine knowing how much she loved her present. This rose will be a part of our memory of this incredibly special day for the rest of our lives. Thank you. At first, it was a little nerve-wrecking to buy internationally, but I am ecstatic with the results. Being able to have open and direct communication allowed me extra confidence in placing my order. Shipping was very quick even though it came all the way to Belgium (my country). This is a unique piece that I would not be able to find anywhere else, and it surpassed my expectations. I plan on future purchases. Your amazing service is appreciated. My girlfriend’s response when she received an Eternity Rose from me was all I needed to know that this was the perfect gift. I know she truly felt the love I was trying to share with her and was authentically surprised. This is a high quality product. When I saw these roses, I knew that there was nothing else like it and I wanted one immediately. I will never regret purchasing from you. 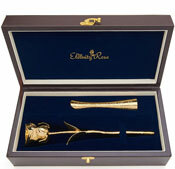 The best thing about the Eternity Rose is the bank for the buck. Purchasing a couple of roses, I was thankful for an affordable price and the free shipping is a real bonus. The presentations of the roses in their leather boxes are remarkable. I bought one for my mum and one for my mother-in-law. These will not be my last purchases, and I plan on making these my go-to gift for any upcoming special occasions. Thank you so much for making this a seamless transaction. I received my package this morning. This really surprised my wife, and she is really happy. (I should expect to be in her good graces for a good amount of time now.) She has plans to purchase two more, for her cousin and for her best friend. We have high regard for your company and will make plentiful recommendations to our loved ones. When I received my rose in the mail today, it was breath taking. It is a first of its kind to me. I was amazed at the amount of gold on the rose, it looks luxurious. I am happy with the product and service. My golden Eternity Rose is absolutely stunning. I had to pass on my compliments and happiness. Shipping was very quick, and the quality is outstanding. I may keep the Eternity Rose a secret for now, so I will have a great gift option for the future. “Really pretty” and “very impressive” are the few words to sum up these roses perfectly. I waited until the last minute to search for something special, and I still got these in time. 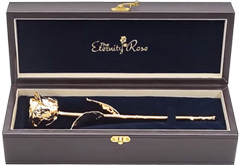 I gave the Eternity Rose as an anniversary gift to my wife, and she told her friends that “It is the best gift he has ever given me!” The only problem I am worried about is, I wonder if I will ever be able to make her this happy and surprised again! She doesn’t have any complaints about this gift! Roses are a common gift for my girlfriend, so I was looking for something more this time. I relied heavily on asking many questions from the staff, and each question was promptly responded to with care and respect. I am quite impressed with the overall experience, and the best news is my girlfriend was ecstatic. I am grateful to you Eternity Rose. I cannot say thank you enough, I owe my eternal happiness to your company and this rose. I sent this to my ex-girlfriend as a symbol of how much I care, and I actually won her back over. You will never know how thankful I am. I received this gift from my son during his travels in Europe. I opened my package, and the most spectacular yellow rose was inside. His thoughtfulness and love will remain in my memory forever. I just received the most beautiful Eternity roses from my son on my birthday. These are truly a unique piece and I will keep them close to my heart forever. As my first online purchase, I was not sure what to expect with your company, but I am pleased to say that I had a wonderful buying experience. The Eternity Rose really is a great company! My girlfriend is in Toronto with family, and she received it without delay. I wanted a way to show her how she means the world to me and how much I miss her. This Eternity Rose was the perfect solution. “It is the most wonderful gift you have ever gotten me” were the words my wife used when she received her Eternity Rose. Facebook received it well with numerous comments and likes. I could not be happier with this purchase. These are exceptional roses. The website does not do the actual roses justice. I couldn’t be happier. It took an enormous amount of reassuring from your wonderful staff to order from your company after a previous, unsatisfactory experience from a competitor overseas. It was so unique and special, I had high hopes, but the staff convinced me that your company would meet my expectations, so I took the leap. My first feeling was to go ahead with The Eternity Rose, and I have learned never to doubt my first gut feeling. Your products match the website completely. Others need to know that other companies out there have less than ideal products. I will stay a faithful customer to the Eternity Rose. After I found your ad, I was inspired to use my tight budget to buy my darling girl a present. I bought the rose and vase as a special gift. She truly loved it. I purchased two golden roses for my mum and a close friend. I was so pleased with these purchases I ordered a silver rose for my 25th wedding anniversary for my husband. Over all these years, my husband has showered me with roses and flowers, which is why I decided to get one that will last forever for him. We will keep this in our house, and it will stand for our deep love. When I came across your site 6 months ago, I couldn’t find anything that caught my eye more strongly after that! I have purchased three roses since that time. Each and every time I am impressed. After three happy purchases, I knew it was time to write in and say great job. I am happy to have found your company. It has made my life easier since I know exactly the gift to give. This rose is amazing, and truly incredible given the price. I received it in the mail today and I wanted to say thank you for answering my requests so quickly. Again, thank you, this is really beautiful. I stumbled across your site as I searched for a big thank you gift for the ladies in our office. The success of our business this year is very much a product of their superior hard work. As I searched, there simply was not anything that I could find that had the quality of your product that could offer such comparative pricing. I gave the gifts at the Christmas party, and as they opened the presents, I watched their reactions, and now I won’t hesitate to think about what I can buy my wife and mother next year. These roses are spectacular! First and foremost, this is the most marvellous rose I have ever seen. As happy as I am to see it, I am more excited to see my wife’s expression when I give it to her. LOVELY is the word to describe this rose. My special girl received the red rose along with the vase. It was shipped to our small country town in a super classy package. I am impressed with the quality of service and product. My pink Eternity Rose gets so many compliments on it. My husband gave it to me on my birthday. He knew it was my number one favourite flower. Since his purchase, I have been checking out your website and I think I may be making a purchase myself as well. As I searched for a special present for my mother’s birthday, I wanted something that bolstered, “I love you!” to her. Her favourite colours are pink and yellow, so I bought her those coloured roses. Tears welled up in her eyes after she opened the boxes. Needless to say, I found the right gift to let her know how much she meant to me, and I wanted to tell you all at the Eternity Rose. I wanted to send my wife a powerful message of my love, and this rose really did the job! Thank you Eternity Rose, she was dazzled. I have to express the biggest possible “Thank You” to The Eternity Rose. 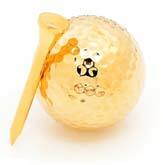 I have had bumpy online shopping experiences in the past, but The Eternity Rose was different. I was pleased to see that the descriptions matched the product received. Thank you again. I really feel that I have to tell you the rose arrived today, and my husband and I are so pleased with it. Our daughter will be so happy. We wanted something that she could keep but as we usually buy jewellery for Christmas, we wanted something different. I came across your site by accident and when I saw the rose, I knew I had to buy it. Thank you so much for this lovely lovely rose. HI ,THE SILVER ROSE HAS JUST BEEN DELIVERED. IT IS FANTASTIC, MY WIFE WILL LOVE IT. I JUST WANT TO SAY, THANK YOU FOR YOUR SERVICE. A VERY HAPPY GARY W.
That is fantastic, you have made my day! This is a 6 star service! I will spread the news to my friends and family. Thank you very much, she's a little gold rose herself.